← Time flies when you’re debating “to juice or not to juice” …that is the question. Holy crap, I LOOOOOOVE lamb!! I do… I really really do. I didn’t for a long time growing up. Now? I crave/need it! My fav are those little lollipop chops that are so simple and easy. Trader Joe’s, Whole Paycheck or even the meat guy at the farmers markets has them on certain days. I love them bbq’d, broiled or roasted. Simple with a little salt and pepper. Cooked just right… pink in the middle, just above bloody. My favorite way tho is inspired from a Giada recipe that is so easy and comes out perfect every time. 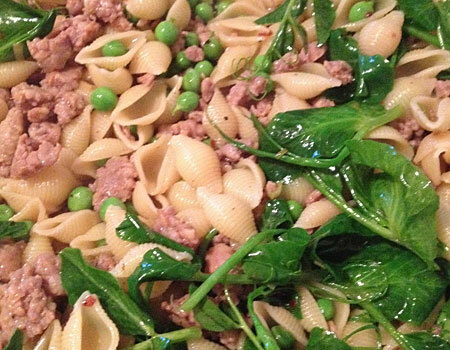 The other night I had picked up some spring goods at the FM and wanted to make pasta with pork sausage, peas and pea tendrils. 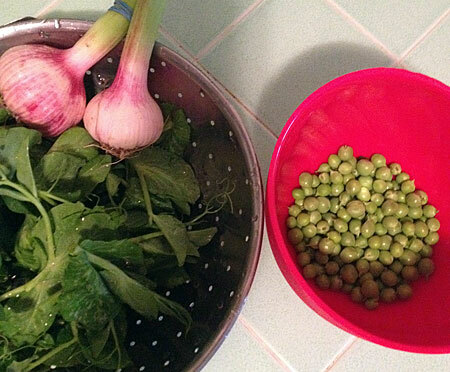 I had some green garlic to toss in as well. YUM! 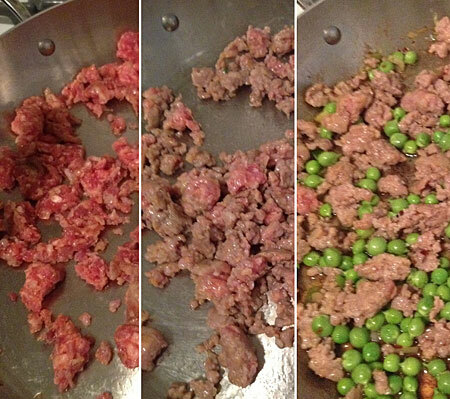 I get a little picky when I start to make my pasta… I HATE over cooked sausage. So I do it in stages to have it cook nicely throughout the entire experience. Slightly get it going, then take it off when it’s still got some pink. Once I’m ready to add it to more ingredients I throw it back into the pan so it can soak up the red pepper infused oils and green garlic flavors. Next I bring in the tendrils and pasta. I like to take let the pasta finish cooking in the pan with all the other ingredients. It’s all so pretty to see and even better to eat! So what was missing on this lovely dinner I was spending time on, sipping wine and listening to music with a nice early evening breeze wafting through my place… what was it? of course… LAMB!!! 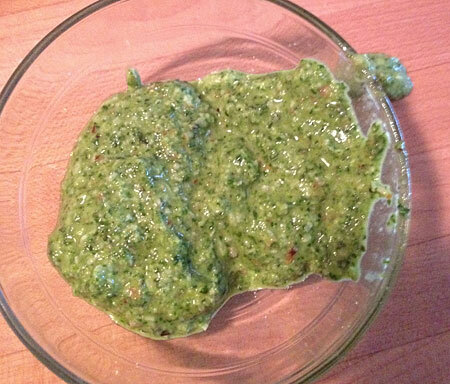 So I take 2 little chops and get moving on that basil mint pesto cause dammit… why not! Normally, I’d sprinkle with Maldon but for xmas I got some gifts at this awesome little store in LA called Rolling Greens where they have items from plants to baby gifts to a room full of fun kitchen stuff. This is where I discovered The French Farm salts. 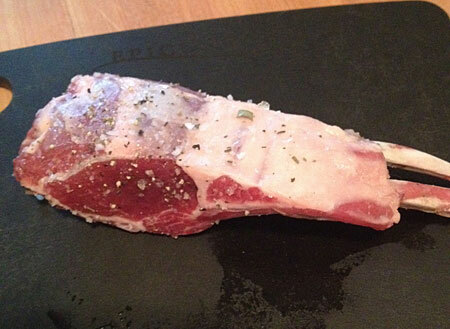 I sprinkled that gardener salt over that little lamb chop and it was ready to go! Dropped that in the oven for a few mins and busted out on the pesto. Basil, mint, lemon, green garlic, parm, S&P, good olive oil and a few shaved almonds (I like instead of pine nuts some times) and puree away! 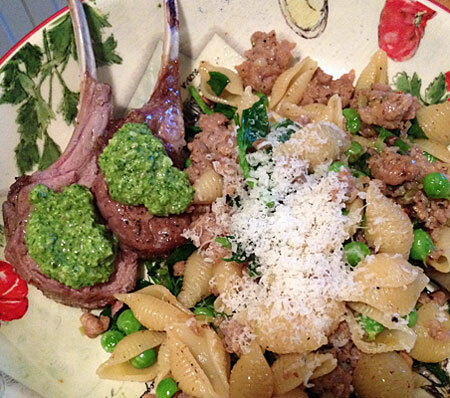 So now I’m all set… pasta is set and two little chops are cooked and rested to perfection. It’s all so simple! And I’ll tell ya… SUPER fantastic to eat! Did I go a little over board with the meats in one dinner? Maybe, but seriously… wouldn’t you do the same thing if you had those ingredients at the ready? I know you would. This entry was posted in cooking, lamb. Bookmark the permalink. 1 Response to Holy crap, I LOOOOOOVE lamb! !